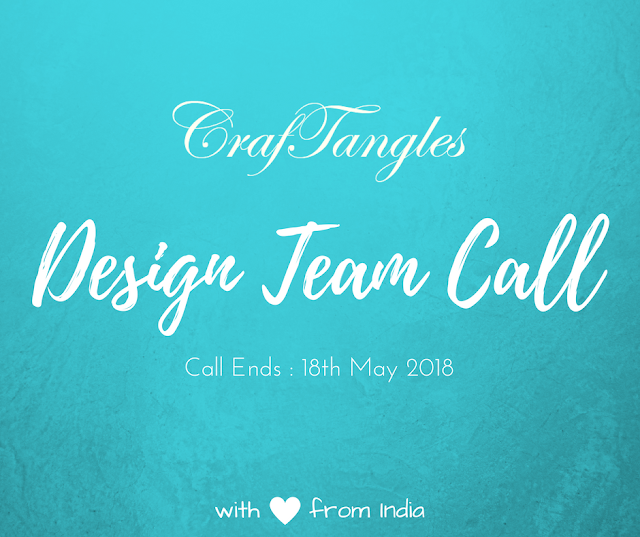 I had a blast this week, playing with Craftangles patterned paper! I have made two cards from each pack of patterned paper to show off their versatility. I started with the "Floral Exotica" (Black Edition) paper pack. This paper pack is SO luxurious!! I really enjoyed working with it. For the first card, I chose Earl Grey Craftangles cardstock to match the patterned paper and used it to "mat" the patterned paper. 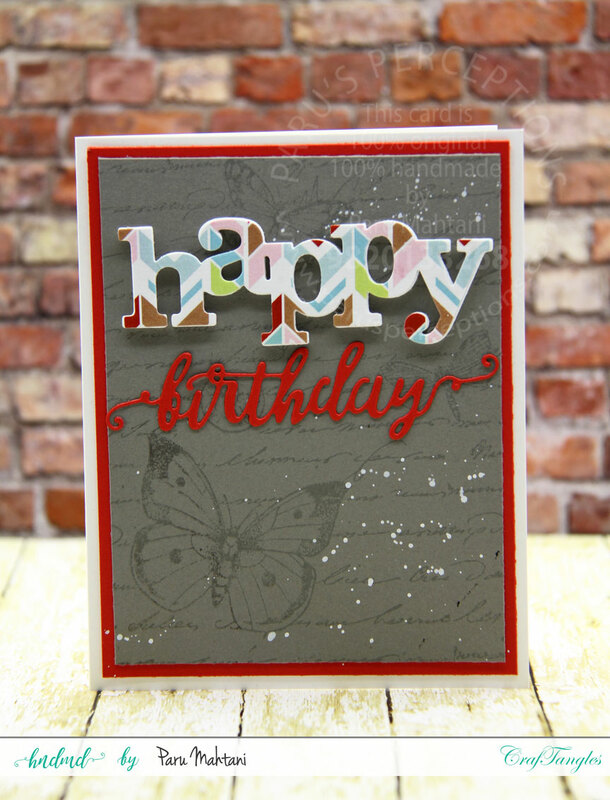 I then heat embossed a birthday sentiment (from Craftangles 'Congratulations' and 'Everyday Sentiments' stamp sets) on vellum and wrapped it around this panel. I finished the card with matching pink enamel dots. 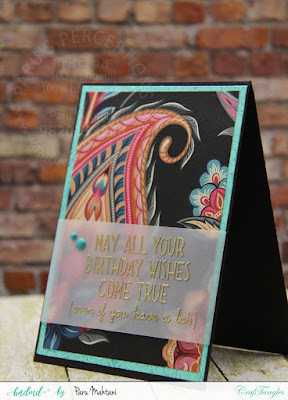 For the second card, I used Craftangles 'Aqua' cardstock to mat the black patterned paper. 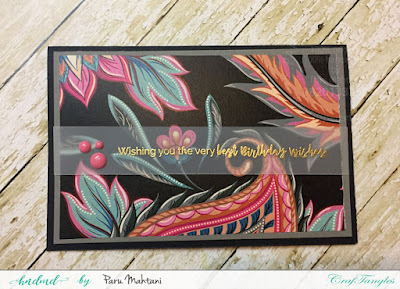 I also stamped the Aqua card stock with a Hero arts background stamp in a tone on tone colour (Tim Holtz 'Peacock Feathers' distress ink) for some interest. I finished the card with some aqua enamel dots. 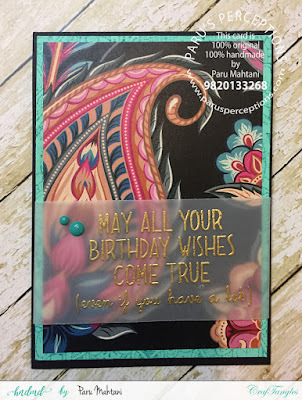 I wish I could photograph the papers in a way to show you how gorgeous they are to the touch...you will just have to get some for yourself to try them out!! 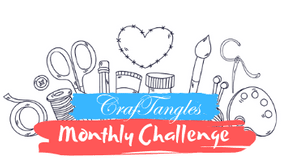 For the next two cards, I have used the Craftangles "All for Love" paper pack. 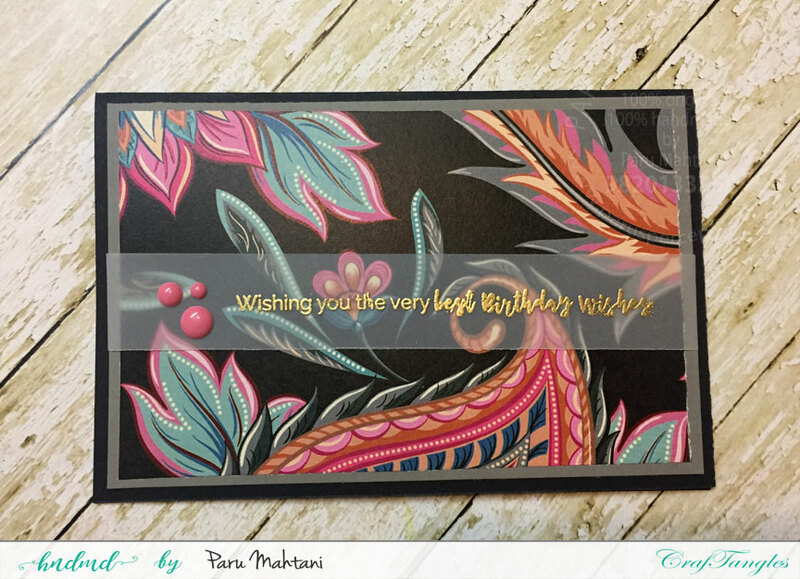 For the next card, I layered three sheets of Patterned paper. I stamped the flowers from the Craftangles 'Mom you rock' stamp set on the paper with the smallest pattern, along with a birthday sentiment from Stampendous. I then cut the sheet at an angle to create some interest. I then placed this sheet over the black ruled sheet to make it pop. I then adhered the entire panel on the pink patterned paper and then adhered the entire panel on a white card base. 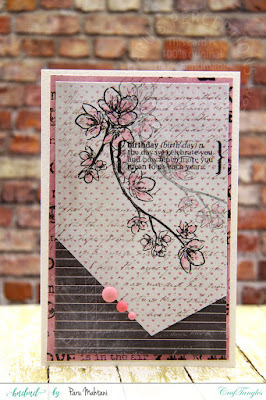 I finished the card by adding some matte enamel dots in two shades of pink. 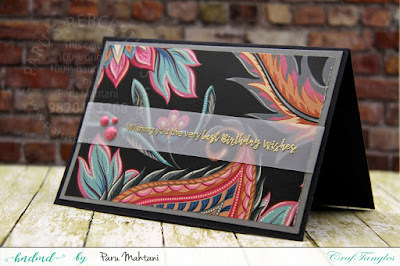 The thing with making cards with patterned paper is that you end up with a lot of scraps! For the next card, I used up a few scraps. I cut the scraps into strips (from the Craftangles "All for Love" stamp set) and layered them to create a panel. I then cut this panel at an angle to create some interest. I then matted this panel on a piece of black cardstock to make it pop. Once this piece was cut to size, I added a couple of scraps of patterned paper as a final layer and adhered them all to the white card base. 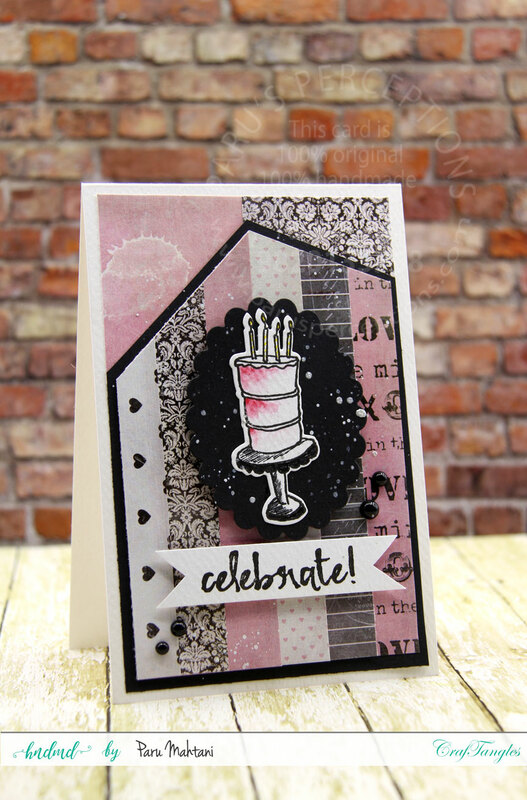 I then stamped and die cut the cake (lightly watercoloured) from the Concord and 9th 'Eat Cake and Celebrate' stamp set, as well as the sentiment. I felt, the image needed something to make it stand out so I die cut a piece of black cardstock with a scalloped oval die to place below the image. Finally, I added some silver acrylic paint splatter and some black enamel dots to finish. As you can see, I have used one paper pack to create two completely different of cards. For the last two cards, I have used the Craftangles "Be My Valentine" paper pack. 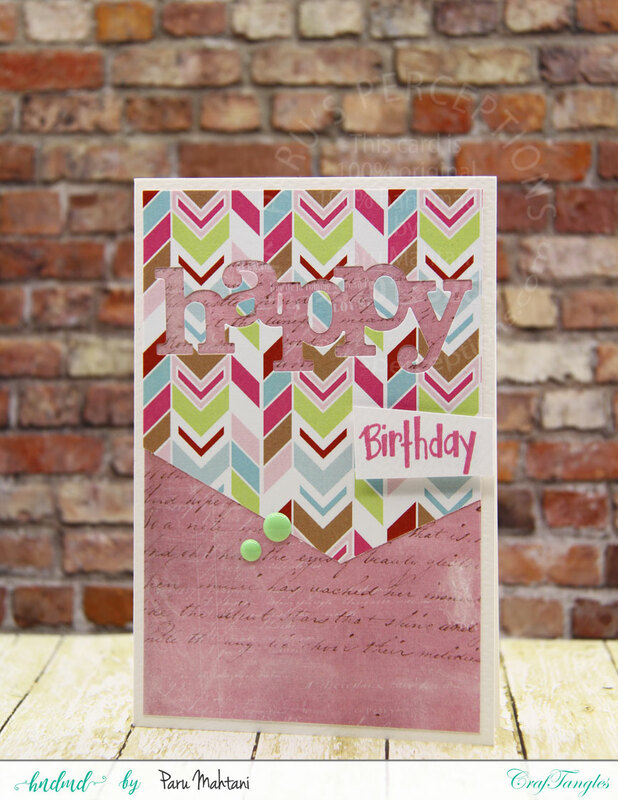 out of the chevron patterned paper. 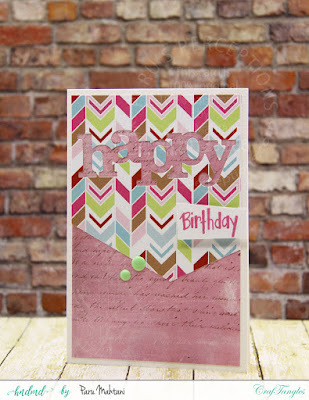 I then cut it at an angle and layered it on the pink patterned paper. Then I inlaid the die cut bits into the word to make it readable. I stamped and added the birthday sentiment and some lime green enamel dots to finish the card. layered it with a piece of die cut fun foam to add dimension. 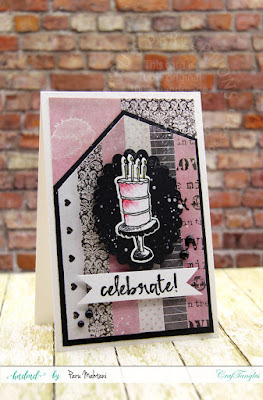 by stamping it with a Hero Arts background stamp and Memento 'London Fog' ink. This created a tone on tone look. I then layered this panel with a piece of red cardstock and adhered it to a white card base. I finished the card with a birthday die cut (from Craftangles) and some white acrylic paint splatter. 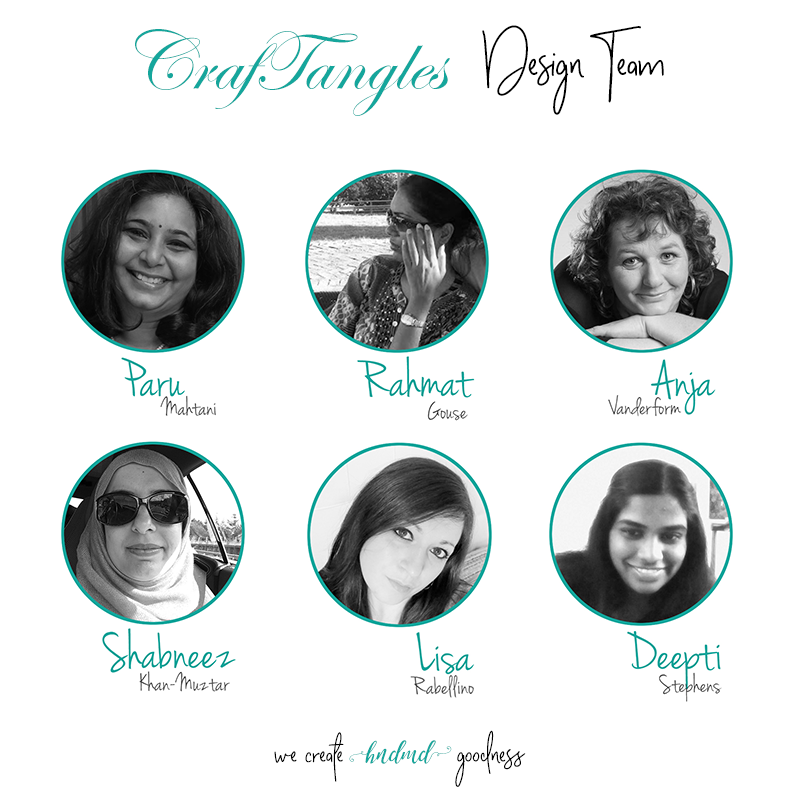 I hope you enjoyed this blog post and will give these papers a try! Superb cards loved the ones with black pp..stunning !